Property Handbook Section 4: Home Exterior Accessories Policy - Muirfield Association, Inc. 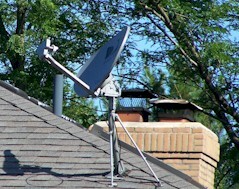 Installation of any satellite dish/antenna in the common elements is prohibited. Lawn Furniture can be a welcome temporary addition to outdoor living areas. When not in use, lawn furniture must be stored on the deck, patio, porch or garage. All inflatable decorations are prohibited. Seasonal or temporary ornamentation, planters and flower pots must compliment the color scheme of the house and must be kept on patios, front stoops or decks. Holiday decorations may be displayed on the exterior of homes at various times of the year. 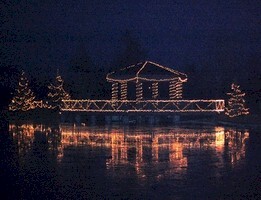 Exterior holiday decorations and lighting may be installed one month before the holiday and must be removed within two weeks following the holiday. Exterior lights must be turned off by 11:00 p.m.
School banners and seasonal flags may be displayed on a deck, patio or interior window only. Window boxes must be approved by the MDCC before installation. Approvals may be granted depending on the architectural style of the home. The MDCC must approve all permanently-placed bird feeders, statues, yard figurines, fountains and other types of lawn ornamentation before placement on the property. Approvals are granted or denied case-by-case based on the conformity and harmony of the proposed plans with Muirfield Design Standards, other structures in Muirfield Village and the effect on natural elements and neighboring properties. All ornamentation must be scaled to fit the area and compliment the architecture of the home. All approved ornamentation must be kept in good condition. The majority of mailboxes on Muirfield Village properties include a unique single-arm mailbox unit specifically designed and built by the Association’s maintenance staff. It is the responsibility of the owner to see that the mailbox unit is kept in good condition. As a service to our residents, Muirfield maintenance staff will install and perform maintenance to the mailbox unit for a fee. Contact the Association office for assistance with repairs and pricing. At this time, there is no fee to re-paint or replace broken or missing numbers. Some sub-associations within our community feature cluster mailbox units or posts specific to that neighborhood. In those areas, owners must contact the sub-association’s representative for assistance with maintenance/replacement. Other styles, sizes or color of mailbox units are prohibited. Attaching signage, banners and advertising, including invisible fencing signs, is prohibited. Shrubbery or vines planted near mailboxes must allow an unobstructed view of the address numbers. Installation of radon units must be approved by the MDCC prior to installation. The unit shall be installed at the rear or side rear of the house, as unobtrusively as possible. All portions of the radon unit shall be painted the color of the adjacent house siding and/or trim. The exhaust pipe shall terminate no more than 18” above the roofline and below the ridgeline of the house. Evergreen shrubs must be planted to screen the motor from view. The evergreens must be at least 3’ in height. Refuse containers should be placed at the curb by 7 a.m. on collection day and taken back inside that evening. Containers may not be left outside after collection day. Acceptable containers for non-recyclable trash include: metal or plastic cans or barrels with two handles and a tightly-fitting lid; sealed plastic bags; or sealed paper bags of a mill thickness of at least 1.5 and a maximum capacity of 30 gallons. All refuse must be secured inside the container. No more than 50 pounds of weight may be placed in any container. Overloaded or wet boxes are not acceptable containers and will not be picked up. The Muirfield Design Control Committee is empowered to protect the natural beauty of the community. Property exteriors must be kept in good condition, free of trash, any type of debris or clutter. Unless specifically approved by the MDCC in writing, no materials, supplies or equipment may be stored on the Property except inside a closed building, or behind a visual barrier screening so that they are not visible from streets or neighboring properties. Construction materials for remodel projects may require special consideration but may not be stored on the lot indefinitely. All exterior construction projects require authorization from the MDCC and the materials or components of the project may not remain on the lot past the completion date approved by the MDCC or no more than 14 days. Large landscaping project materials may not remain stored outside for more than 10 days. Clotheslines are prohibited. Clothing is prohibited to be hung outside any home. Hoses must be stored inside a building or in an appropriate container, out of public view, when not in use. Ladders, wheelbarrows and all other equipment, yard supplies, materials and tools must be stored inside when not in use. Portable grills, chimineas, fire pits and other items designed for exterior home use may be used on private property, but must be stored on a deck, patio, porch or in garage when not being used. They are prohibited to be stored on or on Association-owned common areas. Storing lawn furniture in the yard or landscaping is prohibited. Portable sports equipment and toys may be used in yards, but must be stored inside when not in use. When purchasing larger items for use outside of the home, owners must consider how and where they will be stored. There are numerous exterior storage solution systems available as well as garage organization and storage systems to eliminate clutter. The addition of an exterior storage system as well as permanent structures such as a utility shed or utility screens require the approval of the MDCC before locating on the property.